Have you seen Baby Spa in the store before? 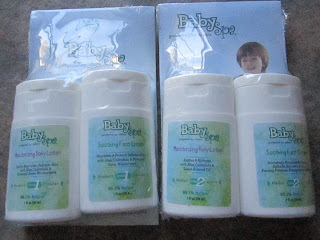 Baby Spa is an over the top line of great baby products like shampoo, diaper rash cream, baby bath, lotion, even a facial for infants and toddlers! I have both a toddler and infant. Sarah who is almost a year and Elizabeth who just turned 3. I tried the Baby Spa on Sarah she was a little wiggle worm trying to get it on her but she gave in finally and loved it. I love it too, I hate a messy lotion! I was shocked when I placed it on my hands to rub Sarah and it absorbed super fast. Instead of moist hands they were really really soft. Nice! I honestly had to keep feeling my hands all day because I was in shock. The face cream is the same you place a small amount on and your face is now super soft. I like that you rub in you don't wash it off. I love these products and now it makes me curious about the rest. I can't stress enough how much I hate the oily feeling majority of lotions leave on you and this just doesn't. It's a first for me. The scent is a baby fresh and then the one which I placed on Elizabeth is a nice citrus. The have 2 stages, Stage 1 is for infant to crawler and then Stage 2 is for walker 4 years and up. All of BabySpa products are 98-100% free of Parabens, Phthalates, Sulfates, Polyethylene, Bisphenol A and Mineral Oil to top it off they do not test on animals. Helpful ingredients you will find in most of BabySpa products are Kendi Oil, Kizis, Nyamplung Oil, Patented Swiss Moisturizer EG-28 and finally Songa. Every ingredient has a purpose to make sure its safe and soft on baby's skin. You can purchase these great products at most major retail stores, along with this link here. 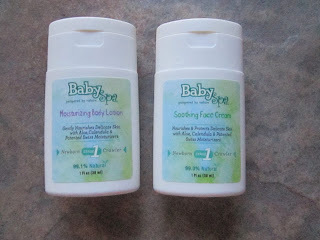 Disclosure: I was given samples of BabySpa to help with my review. All opinions are 100% mine.